My basement is flooding from ground water and I would like to schedule an assessment and estimate. I am purchasing a home, the appraiser needs the crawl space to be 18" all over, at some points it is 14", not large, but need this done in order to close on the home by the 30th of this month. I also would before winter want to insulate, since the home has no basement or slab. I am assuming post and beam. The urgency now is digging out the crawl space to make the inspection correct . Frustrated since not sure who to contact with such short notice to me the buyer. Or you may know someone in the area that can level this off. I do not think it is a big project but the appraiser also needs an invoice. Odors from basement. There is a crawlspace under the bedroom portion of the house with no vapor barrier. I am on the Building commitee at the First Congregationl Church in Onekama Michigan. The church is 125 years old and in recent years we are experiancing more and more problems in the spring with seepage through the foundation and minor flooding in the basement which is finished. The foundation was tiled in the '20s but I fear the tile has given up and a retile and water proofing of the walls may be needed. Onekama has a high water table traditionally. If you perform work in our are please contact me. You have come recomended by one of our congregation. I just need a quote for encapsulating my dirt crawl space of 700 square feet. Thank you. Very impressed. The men were cheerful and very respectful. I have never been called 'sir' that many times in one day. Made for a very nice day. Very professional. EXTREMELY impressed with how polite and courteous every member of the crew was. Call Rep. was very knowledgeable and helpful. Made my wife and I comfortable in choosing Ayers. I am extremely happy with the work these young men did and the work ethic they practiced. Thank you! "Great! If I owned a business I would want to hire employees..."
"My basement walls were bowing and I did not want to replace..."
Ayers Basement Systems has been serving Manistee homeowners for the past 35 years. Our locally owned and operated businesses provides professional basement waterproofing, crawl space repair, concrete leveling and foundation repair. If you need help with your below-grade service, we are Manistee's trusted contractor. Water in the basement or crawl space means eventual mold growth and rot. If left ignored, over the years the damage to your home can become extreme. To prevent that from every happening we install a waterproofing system in the basement and an encapsulation system in the crawl space. We protect your Manistee home. Ayers Basement Systems is a member of Basement Systems, the international network of basement & crawlspace waterproofers. As part of the network, our waterproofing specialists receive advanced training in waterproofing techniques. They also receive access to exclusive, patented waterproofing products. All these products together form a complete basement waterproofing solution. We install an interior drainage channel along the inner perimeter of your basement. Any water entering through the basement walls is collected into the channel and runs to a sump pump. The pump evacuates the water out and safely away from your home. 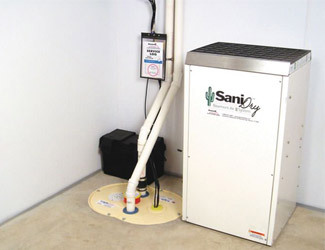 The systems is completed with a energy-efficient basement dehumidifier. By removing the water and controlling the humidity in the basement mold and rot are prevented. If you have a crawl space rather than a basement, we can protect the area with a similar system. An insulating mat is laid on the crawl space floor and then a thick, vinyl vapor-barrier is placed on top running up the crawl space walls. The vapor-barrier prevents water from seeping into the crawl space. The crawl space vents are close and a sealable entrance is installed. A crawl space dehumidifier and sump pump are added to complete the system. Any entering water is immediately removed and the space is insulated and sealed. No mold, no rot and no cold floors over crawl spaces. Foundation issues are much more serious than basement waterproofing problems as they can permanently damage your home. Foundation problems need to be corrected quickly and professionally. Ayers Basement Systems permanently repairs foundations for business and homeowners throughout Manistee. 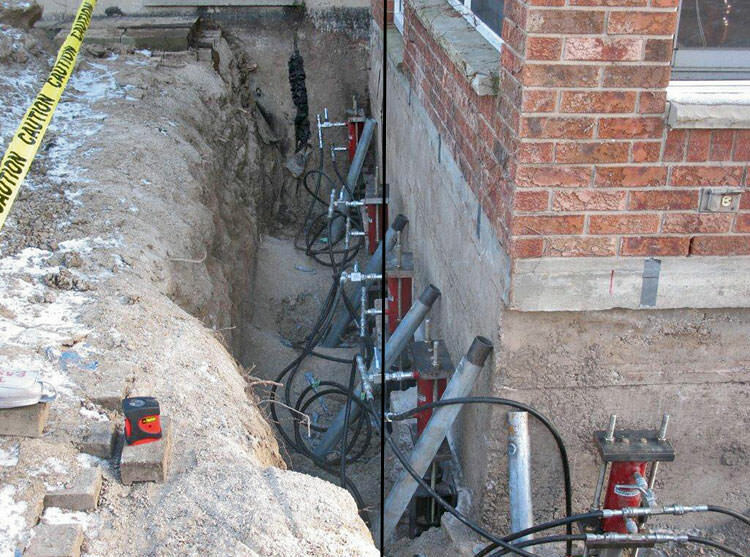 We use a number of different foundation piering solutions to correct sinking or settling foundations. These include helical piers, push piers, slab piers and helical deck piers. These piering systems drill down to a stable soil base capable of lifting and supporting your home in its original position. Whatever your foundation issues, we have the right solution. If your home has sunken concrete slabs in your driveway, patio, sidewalk, etc. we use an updated variation of mudjacking to correct the problem. Mudjacking or slab jacking traditionally involves pumping a mudslurry beneath concrete slabs through holes drilled through the slab. Rather than using a heavy mudslurry we use PolyLEVEL, an expansive polyurethane foam. The foam expands to fill all the gaps beneath the slab, lifting it back to its level position. The foam is also much lighter than mudslurry putting less stress on the underlying soil. PolyLEVEL also cures within hours rather than the days that mudslurry takes. Ayers Basement Systems is Manistee's trusted concrete lifting and leveling contractor. Poorly taken care of crawlspaces, negatively affect the whole home whether you know it or not. It can make the air bad to breathe, raise air bills, all of that stuff. Well, this customer from Manistee called us about his crawlspace that we wanted insulated. We installed two things. 1) CleanSpace. CleanSpace is a 20 mil thick plastic liner that fits to the crawl space to completely seal the home from the earth. Polyester cord reinforcement allows for a lot of durability, to make it last longer than the home will. This liner also contains an antimicrobial additive to prevent mold. We also installed Frothpak. This is a spray foam insulation used on rim joists and hard to reach areas. FrothPak does not absorb moisture, so it does a great job at sealing crawlspaces from the outside environment. Now this homeowner will have a perfectly insulated crawlspaces for years to come. Gary O. from Manistee, MI had a wet basement before he called us. Water was spilling in relentlessly and he had tried to fix it himself with no prevail. Thus, he gave us a call. The WaterGuard French drain rests below the floor of the basement and the foundation footing, catching all the water that seeps into the basement from the walls. Once this water is caught, is it is redirected to the sump pump to be pumped up and out of the home. In this case, the SuperSump does this job in perfect harmony with the WaterGaurd drain. Joe B. from Manistee, MI lives in a house that was built in 1910. It has a poured foundation, and the foundation had vertical cracks up and down the entire wall. The east wall was bowing and this problem had to be stopped before serious damage took place. Our solution? The PowerBrace foundation wall repair system. Designed to repair tilting, bowing, or buckling foundation walls, PowerBrace is made of steel I-beams that secure to the joists above the foundation wall, offering maximum support. PowerBraces even have the strength to potentially take the foundation wall back to its original position, on top of supporting it. Joe can be pleased that his basement and home are now safe to enjoy with the PowerBrace system. Brian R. gave us a call because there were some cracks in the floors and walls of his basement. The home was built in the 1920's out of cement block, and is now cracking horizontally, vertically, and stair-stepping. The floors were uneven and they had sticking doors and windows. Our solution? Helical piers. Helical piers provide anchoring strength as the weight of the foundation or structural element is transferred to the pier. They also have a great deal of versatility for stabilizing and restoring foundations and masonry elements. Cracking foundation -- no problem. Wet basement, cracked basement wall. Crawl space. I am only in Mainstee on Friday-Sunday I work In GR. The house we need inspection on is located in Ludington, MI. Basement is continually wet and crawlspace needs encapsulation. Also if you call and you get the answering machine please leave a message. Thanks.